Property Info: 2 Bedroom, 2 Bathroom Oceanfront Unit, Sleeps 6. 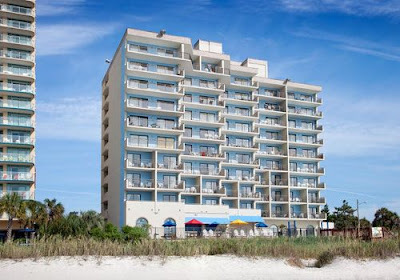 BlueWater Resort beachfront vacation rental condo in Myrtle Beach South Carolina. This 2 BR, 2 BA condominium home has everything you need in a Grand Strand vacation rental. Three queen beds provide sleeping accommodations for up to six. In addition to its own washer and dryer & iron & ironing board & a hair dryer for your convenience. The condo features and extra wide balcony that’s accessible from the living area and master bedroom and provides fantastic view of the Atlantic. A great spot to greet the new day or relax at days end, it’s also a great place for guests to check in with their online community using the resorts free Wi-Fi. A full kitchen offers a coffee maker, stainless steel appliances and includes a built-in microwave and dishwasher along with ample counter and cabinet space. Guests can also dine at the resort’s onsite restaurant and lounge or at a variety or restaurants just a short walk or drive away. Additional community amenities include indoor & outdoor pools and hot-tubs, a poolside bar and a first-class oceanfront fitness facility overlooking the beach. Myrtle Beach SC is a popular vacation destination, golfing destination, retirement community, and family vacation spot. Myrtle Beach has numerous activities for the whole family, like the Carolina Opry, Medieval Times, Springmaid Pier, ice-cream shops, live music, the boardwalk etc. Shop and dine at one of Myrtle Beach’s outdoor entertainment complexes, or explore the beaches of the Grand Strand – each with a unique personality. Myrtle Beach is one of the major centers of tourism in the United States because of the city’s warm subtropical climate and, of course, the beaches – the area attracts approximately 14 million visitors each year. The Myrtle Beach population is 29k+/- with the Myrtle Beach metropolitan area population 465k+. Take a break, come discover the popular coastal town. The post BlueWater Resort Vacation Rental, Myrtle Beach SC appeared first on USBeaches.net.